There is this theory about movies that states that any movie starring, say, Tom Hanks exists a universe where there is no famous actor named Tom Hanks or who looks like Tom Hanks, because if Tom Hanks the actor existed in, say, the universe of Cast Away, then every minor character would be going up to the main character in that movie and asking, “Hey, has anyone ever told you you look exactly like Tom Hanks?” to the point that it would inhibit the plot of the movie. This 2010 blog post introduced me to the idea, and TV Tropes has an extensive list of of works that reference this Celebrity Paradox, including that awful scene in Ocean’s 12 in which Julia Roberts’ character tries to pass herself off as Julia Roberts. The matter gets complicated considerably when the fictional universe in question revolves around celebrities and all the more so when those celebrities happen to be a mix of real-life ones and fictional ones invented for the show. Most of the celebrity characters featured on the show are fictional characters. However, some of them are played by people who are famous in our universe for being singers or musicians. Courtney Love, for example, plays Elle Dallas, a sort of Stevie Nicks by way of Madonna. 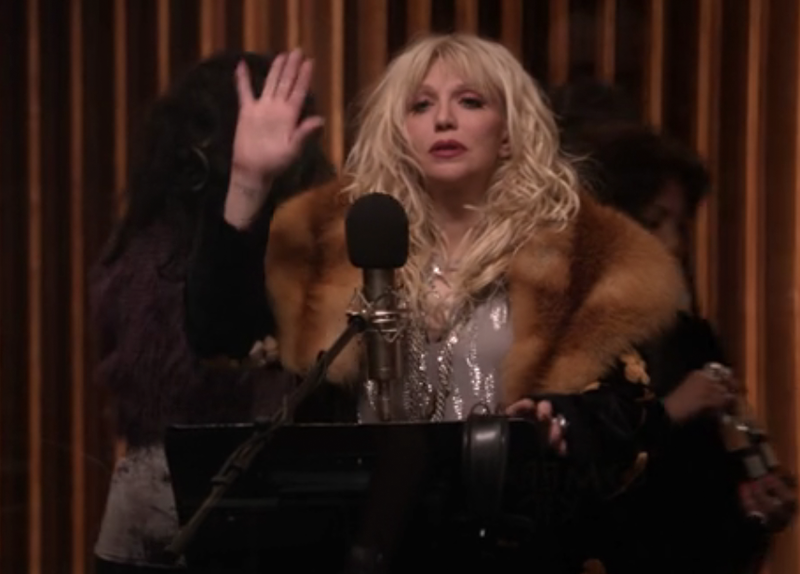 But the implication of this character existing on Empire is that Courtney Love probably doesn’t, but when you get into that, things get complicated. If Courtney Love doesn’t exist, does Nirvana? Does the Empire take on Nirvana go down a different route? Could they still be together? And who starred opposite Woody Harrelson in The People vs. Larry Flynt? I mean, If Hole never released a song called “Jennifer’s Body,” then what did Diablo Cody call her movie? Or did that movie just not happen over there? Good for them if so. Jennifer Hudson also appears on the show playing a fictional character, so it’s presumable that in the Empire-verse, a woman named Jennifer Hudson probably didn’t rise to fame as a result of competing on American Idol. And Jennifer Hudson therefore probably didn’t perform at this 2009 tribute to Patti LaBelle, who played herself on the show. Of course, there’s some higher-ups who will probably say, “Yeah, it doesn’t matter,” when it comes down to the decision to nix a line or guest appearance just because it would seem to question the universe of the show. After all, 30 Rock created a fairly consistent alternate universe version of NBC in which Saturday NIght LIve didn’t exist, but it still featured Jimmy Fallon as the host of the The Late Show, even if he wouldn’t have had a reason to have become famous without SNL. Even The Comback threw off a reference to Matt LeBlanc, even if the Comeback-verse version of Friends probably didn’t star Lisa Kudrow. Maybe that Kudrow never went into acting, maybe never stopped using her science degree to study headaches. Maybe someone else played Phoebe. But then what of the episodes involving Ursula from Mad About You? It’s a headache that Dr. Kudrow could probably give medical advice about, if only she existed in this universe. Raven-Symoné also appeared on Empire, so you have to wonder if someone else played late-in-the-series moppet Olivia on The Cosby Show. Then again, the character she played on Empire was also named Olivia, and one of the most significant things her character did on the show was to introduce a surprise moppet to the show’s central family. It could be a coincidence. It could be a knowing wink. Either way, it’s fun to think about how casting an actor to play a minor character on this kind of show can speak volumes about the world in which the show takes place. Read more: courtney love, empire, tv, what do you do with a BA in english?